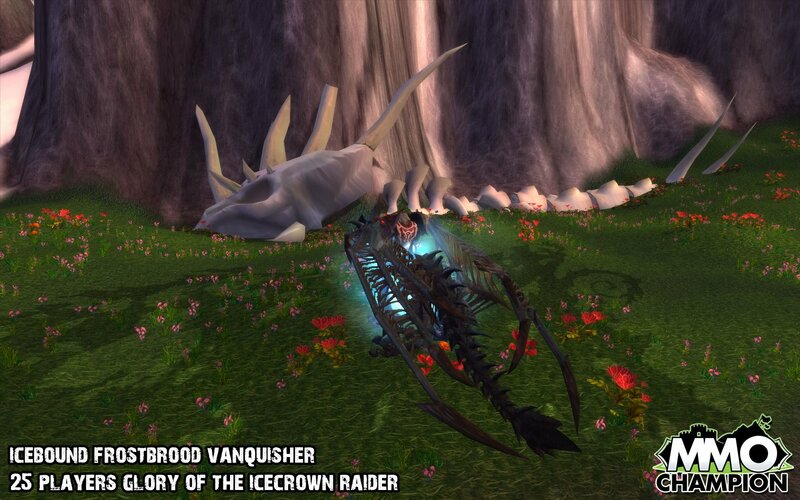 Reward from one of the "Glory of the Icecrown Raider" achievements, not sure if 10 or 25 now. Does anyone have any idea what this looks like? i remember seeing one in a video. 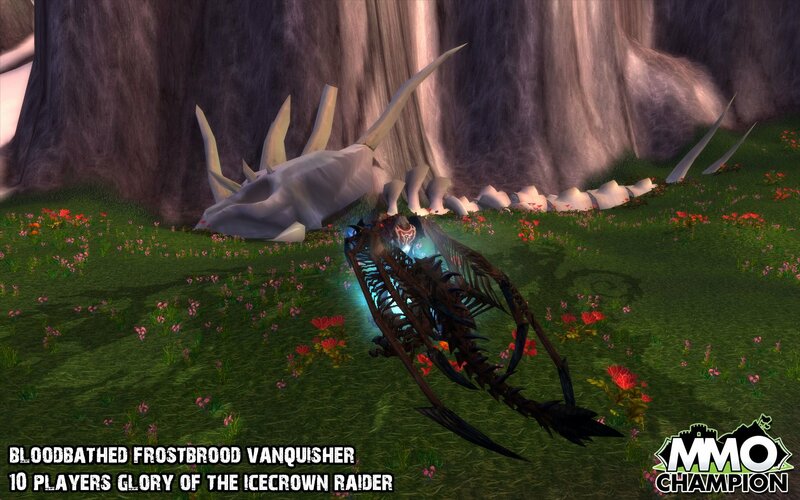 Just clearing up a few things, this is a armoured frostwyrm mount. It sports the "new" frostwyrm model and is a reddish brown colour. 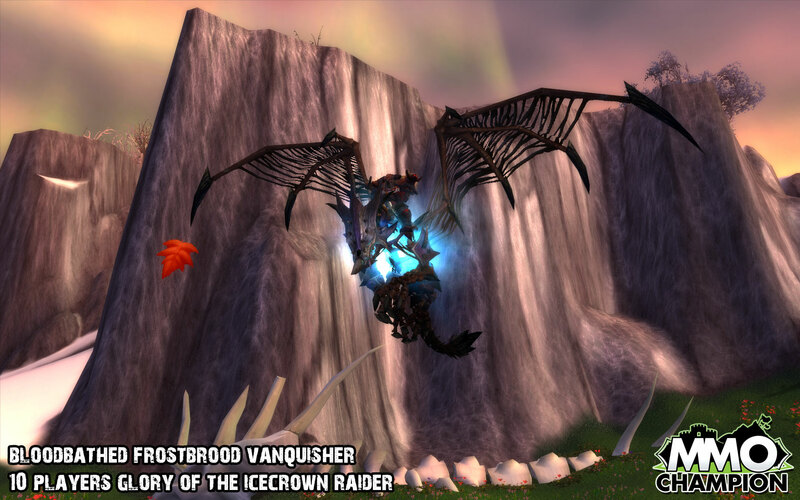 The Bloodbathed Frostbrood Vanquisher and Icebound Frostbrood Vanquisher are now confirmed rewards of the Glory of the Icecrown Raider (10 player) and Glory of the Icecrown Raider (25 player) achievements. They are both 310% speed mounts. At first glance, looking at the ground picture, I thought they looked almost identical, but looking at the other angles you notice the blood color on the wings and legs of the 10 man version vs. the "icier" purplish grey on the 25 man version much more easily. as a priest, i really wanna see what this looks like in shadowform. i bet it will look pretty beastly. As the Lich King's influence wanes, some of his more powerful minions have wrested free from his grasp. 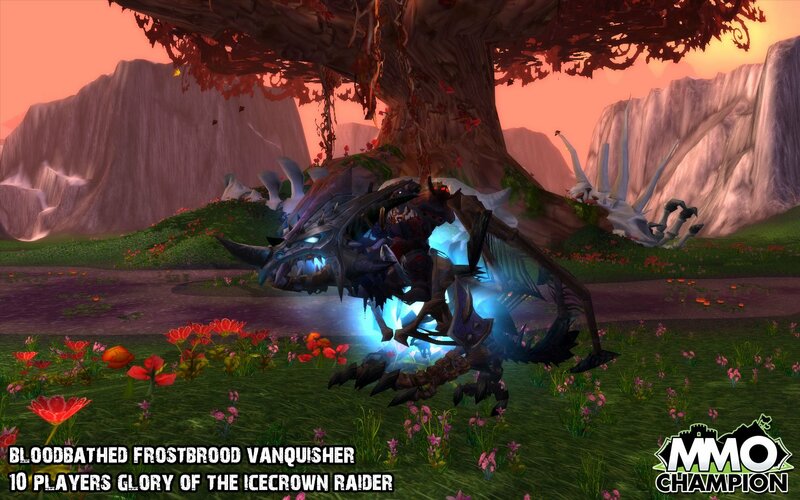 This frost wyrm drake my men captured is a prime example. She has a will of her own and then some. One of my men lost an arm breaking her in, but she now takes to riders fairly well -- provided they themselves are skilled and strong willed. Please accept this magnificent beast as a gift from the Knights of the Ebon Blade. It was an honor to fight along your side in this greatest of battles. The letter attached with the drake. this is the coolest 10 man achievement reward. With the sundering event came the ability to purchase the 310% flight speed for 5K gold. Prior to that 310% flying was available only using one of a select few mounts that could fly at that speed. All were either difficult, time consuming or both to obtain. Anyone who possessed such a mount when the change happened received the skill for free. So, when this mount first came out it was a 310% mount. But now its speed depends on which level of Riding skill you possess. 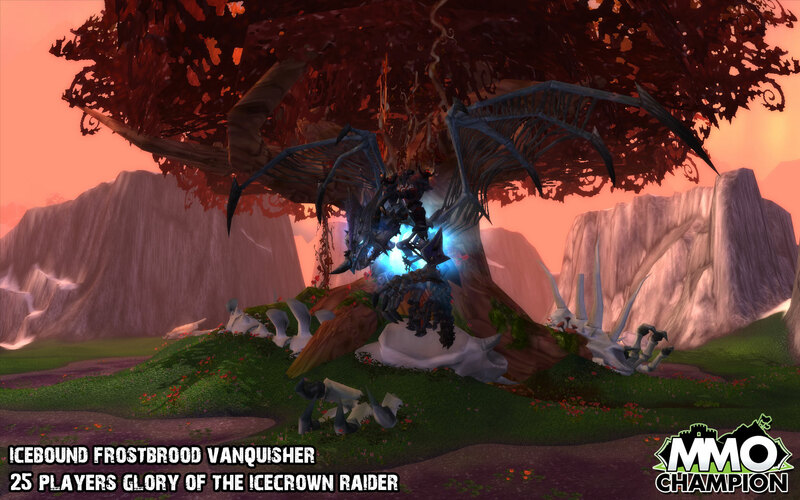 Summons and dismisses a rideable Bloodbathed Frostbrood Vanquisher. This is a flying mount. "Bloodbathed Vanquishers are so named when it is determined that a reanimated frost wyrm died a particularly gruesome and bloody death."